Ahmad is 8 years old. He has brown hair and his dark eyes look around astonished. His brother, a few years younger, looks like him, only a little bit shorter. Both very quiet, they are playing together. Their mother wears pink trousers and her hijab is full of colors. With her green eyes she looks at her daughter, the youngest among her children. Next to her, her husband is waiting with patience for his turn. The whole family speaks only Dari, one of the languages spoken in Afghanistan. I understand that they want to make an appointment for a Skype interview, even though we do not have a common language to communicate. The extent of my poor knowledge of Dari comes from the few words I learned in the field, so we communicate mostly through gestures, expressions and smiles. Sometimes the mother looks at me in a strange way: I am not sure what she is thinking while observing me. Is my attitude strange in her eyes? Or is this her way of watching the world? The children are drawing. Every time I speak they raise their heads with a curious expression, as all children do when they don’t understand what the other person is saying. Ahmad and his brother can speak only Dari. 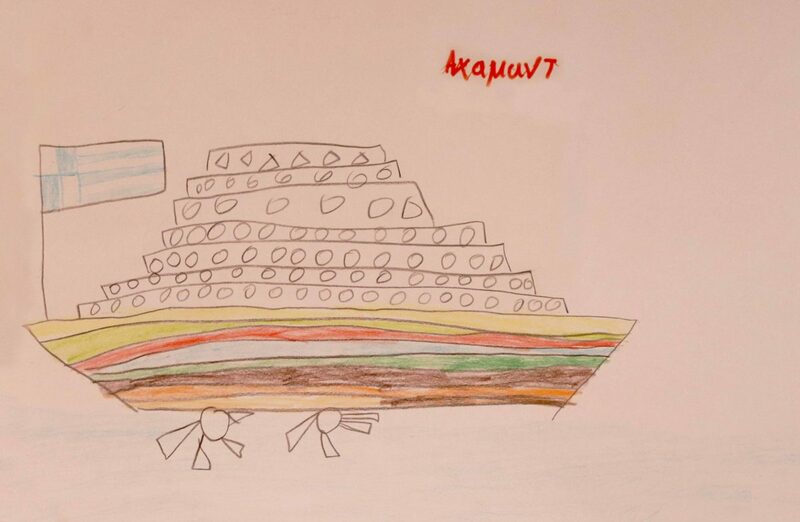 The drawings of the children seemed to reveal future engineers: detailed ships and houses are drawn on their papers. All lines are perfectly straight. The perfect architecture in their drawings is in amazing contrast with the childish figures of people they draw, making the drawings even more beautiful. I have no idea why I was so attached to this family, but I have always felt that there was something special between us. No language of communication, different cultures. But we could understand each other. In our silences, in our expressions, in our smiles. I met them at least two other times outside the office. Once in Elliniko, where they used to live in tents. Once on the metro, while I was going to Piraeus to take a ferry. They made me laugh, calling me “Skype” and saying “Hello!”. Ahmad is almost 9 years old now. His brother is still a little bit shorter than him. Even though they grew up, it is very easy to recognize them. They are sitting on the sofa, drawing together. Ahmad is drawing a ship: it is even more perfect than the one he drew the previous year. Their mother is looking at me again with that same strange expression. It is probably just her natural expression. It’s about one year after their Skype appointment, and they are in our office again. This time, the reason of their visit is that the father is looking for a job. The father sits for his turn. He smiles. He speaks Dari, but our Dari interpreter is absent, so there is no possibility for him to communicate with us. It becomes impossible to write his CV. Ahmad is still sitting on the sofa. When his father calls him, he puts his drawings aside and goes to sit next to him. “My father is a carpenter,” Ahmad says in Greek. “He was working in Afghanistan,” he adds. Then he turns towards his father and asks him in Dari, “For how long?”. Greek and Dari are mixed in an amazing conversation where the interpreter is Ahmad, this nearly 9 year-old child. Communication is possible because of him exclusively. Ahmad and his father write the CV together. Together the whole family participates in writing their new life here in Greece. It is not easy to draw it, but this is the place where their new life started. This is the place of their present and their future. Here is the place of their new beginning.